There are still great misconceptions about what following a plant based diet means and what it entails. For most people we’ve found the biggest hurdle is overcoming eating out, be it visiting friends houses or frequenting their favorite restaurant. Here are our Top Five Tips for Overcoming Social Hurdles when making the transition to a vegan, plant based diet. 1. Have good reason. If you know why you’re changing your diet – be it for your health, the environment or both, stand strong and don’t be afraid to share your reasoning. People will question you but if you believe in what you’re doing and are benefiting from your new eating style, it’ll be easier to stay in your truth. 2. Be prepared. When visiting friends, going traveling or visiting a restaurant, plan ahead. Give the restaurant a quick call to see what your options are, potentially bring something along with you (salad dressing, cooked grains, pulses) and get in the habit of carrying snacks with you. If you’ve been invited over to someones home, offer to cook a dish for everyone to share. 3. Choose wisely. Thai and Moroccan are great restaurants to frequent because many of their dishes are plant-based. 4. Focus on the experience. Rather than getting caught up by the actual dining element of your get together or night out, focus on the other aspects of the time spent with others! The great company is far more important and integral in the grand scheme of things. 5. Suggest, comment, review. Give feedback to the restaurants that you frequent. Your comments may encourage the restaurant to improve their plant friendly options or adapt existing offerings to meet a wider variety of dietary needs. And, if you come across a restaurant that’s doing a good job of it, send them a little praise. Here’s a little taste of the sorts of meals we serve up in our plant-based restaurant. We would say ‘whip up at home’ but what we cook for the masses, we eat ourselves! 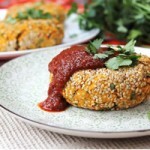 Sweet potato based cakes with chickpeas and fresh spices. Spread sweet potato onto prepared baking sheet and bake for 30 minutes until soft. Remove from the oven and allow to cool. Keep the oven on. In large bowl mix together sweet potato, chickpeas, garlic, tamari/Bragg's/soya sauce, lemon juice, cumin seed, ground cumin, ground coriander, paprika, salt, pepper and cayenne. Mash together with a potato masher, fork, hand blender or mixer until everything is well combined and the chunks of sweet potato are broken down nicely. Next, add the fresh parsley, coriander (also called cilantro), scallions and red onion. Mix until everything is combined. Add in chickpea flour and stir well to combine. Rotate mixture with your hands and shape the dough into four large cakes/ patty’s (like a burger). 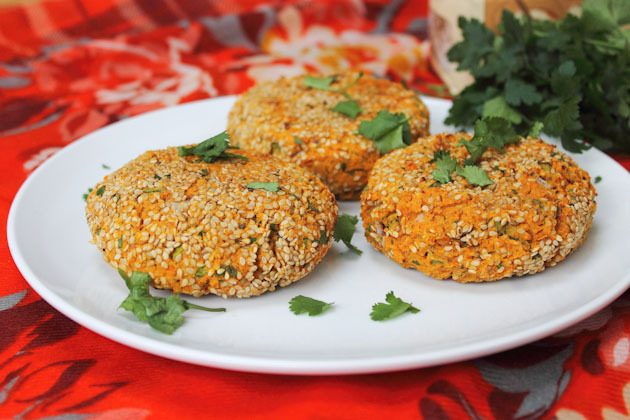 Sprinkle each with sesame seeds and lightly press the seeds into the patties so that they stay on while baking. Rotate the cakes and do it again so that the seeds are on either side. Place each patty on a baking sheet that has been lined with parchment paper or a silicon baking mat and bake for 15- 20 minutes. Flip over half way through. 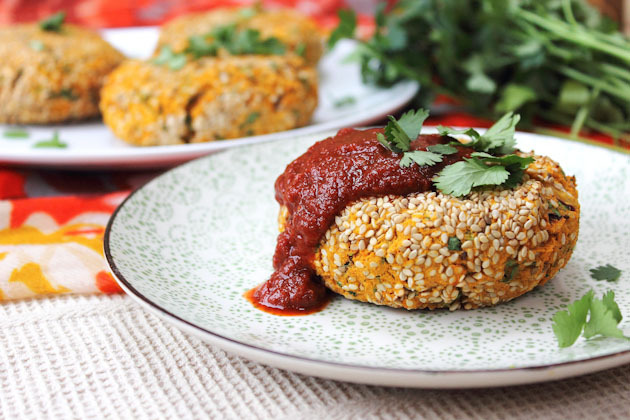 Feel free to replace the chickpea flour with any whole grain flour of your choice. 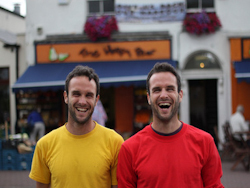 Author bio: David and Steve run a wholefood store, healthy café/restaurant in Ireland, and operate the Happy Heart Course – an online course designed to help people improve their overall health and well being by transitioning to a plant-based diet for four weeks. What fuels this dynamic duo? Meeting new people, chatting about the power of the vegan diet, and hearing about their students’ health successes. Connect with David and Steve on Twitter, Facebook or on their Website. Do you have tips on how to eat healthy/plant-based when you’re out and about? What’s your favorite restaurant that just does everything right every time you visit?